According to quantum bio-physics, all living organisms emanate a weak electromagnetic field. This field consists of a wide range of different frequencies which radiate from different organs in the body. Every cell and organ in an organism has its own characteristic wavelength in the electromagnetic spectrum. In fact, there is a continuous flow of electromagnetic waves and biophotons in and between the cells which facilitates an interchange of information between the cells. External and internal pathogenic influences within an organism can produce electromagnetic waves which are atypical of the normal waves produced by the organism. Waves produced by pathological influences are characterized by non-periodic oscillations and are always found in any living organism. On the other hand, waves with harmonic oscillations are only found in human beings in normal and healthy state. Figure 1. From left to right: non-periodic oscillations, periodical oscillations and harmonic oscillations; T and w – are period and frequency of oscillation, correspondently. Certain wavelengths and oscillations are necessary for the organism to stay healthy and alive. When pathological waves which alter the normal waves are not removed by the body of the organism through self-healing, or self-regulation, disease will arise as a result of a significant change to the dynamic balance of the organism’s electromagnetic waves. There are different methods to detect areas of pathological oscillations in the human body. One of the most precise and easily demonstrable methods is the ‘Gas Discharge Visualization’ (GDV) method. Figure 2 shows the GDV method visualised with the help of a special ‘Aura’ computer program. On the left is the image of pathological oscillations in a person with problems with the heart, kidney and liver whilst on the right is the image of a healthy person. Another method of representation is the ‘Energy Imbalancement Diagram’ which can define pathological oscillations in the endocrinal system. Figure 3 shows the diagram of an unhealthy person whilst Figure 4 shows a healthy person. Figure 2. GDV Energy field for unhealthy (left) and healthy people. Figure 3. GDV Diagram of unhealthy person. Figure 4. GDV Diagram of healthy person. If the pathological oscillations in an organism are removed, its cells can then use self-regulation to re-attain its dynamic balance, which was earlier not possible due to the blocking influences of the pathological oscillations. Thus, the control of electromagnetic oscillations is amongst the most vital of functions in an organism. This process can be termed bioenergetics correction. In physics, it is established that any oscillation in a wave can be compensated, neutralized or removed by directing against it a wave of the same size and frequency, but with an inversed oscillation. Such a procedure to eliminate pathological oscillations could be effected in some form of therapy. The principles described here can be applied to modern medicine in the following way: all medical products come with certain spectra of electromagnetic oscillations. If these oscillations coincide with the oscillations of the biological object (organs, tissue or cells), changes will appear in the parameters of the oscillations. Therapy facilitates the correcting of vital functions of organs under the influences of electromagnetic waves, working within predetermined parameters where correcting waves will come into contact with the waves emanated from the organs. The BAE products work on users as a therapy by cancellation of pathological electromagnetic waves. The results include improvement to health, reduced stress and the opportunity of healing or beginning of treatment. 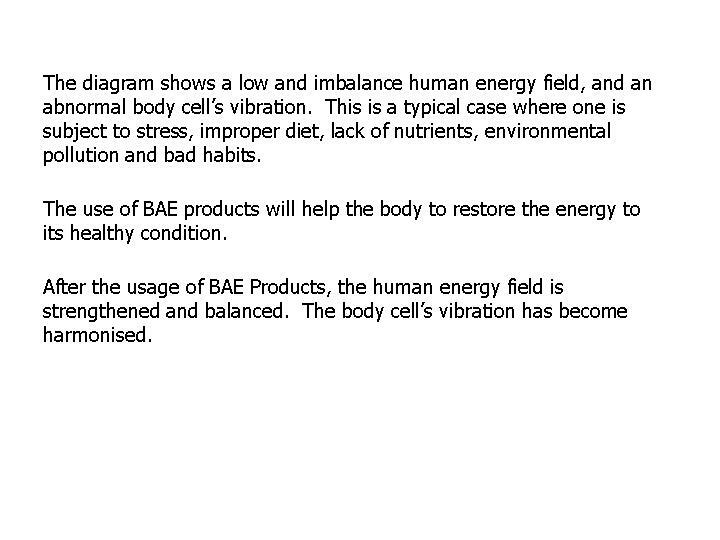 The BAE products work with the electromagnetic field of a person. Within the BAE products are matrix filters where physiological and pathological waves are separated. Physiological (harmonic) waves are amplified, and pathological waves are reflected back to the user in inverted form. The results are the strengthening of physiological signals and the weakening of the pathological ones. The electromagnetic field of the patient instantly reacts to the therapeutic signals of the BAE products. This process happens in microseconds and continues indefinitely, suppressing and destroying pathological oscillations and gradually restoring the physiological dynamic balance of the patient. Over an amount of time, the process of self-healing within the cells of the patient begins. Certain types of BAE products are not sources of electromagnetic waves in themselves but matrices (resonators) capable of selectively absorbing and amplifying external waves. Thus, placed in the electromagnetic field of a bio-object, the products become sources of secondary radiation in the spectrum of waves specific to the bio-object. This phenomenon of resonance is affected on the bio-object’s particular frequency of oscillation. It is like a radio being tuned to a particular radio station’s broadcasting frequency, where sensitivity to the signal sharply rises if the frequency is equal on both the radio and the radio station. One of the physical mechanisms of BAE products is inversion: electromagnetic waves oscillations emitted from the patient are inverted 180 degrees, amplified and emitted back to the patient. Thus pathological fluctuations are extinguished while normal physiological waves undergo no significant changes. This mechanism is used in certain kinds of BAE products – BAE Synergy Touch, BAE Synergy Ring and BAE Synergy Sticker. These products are capable of resonance on certain frequencies and inversion of a certain range of pathological waves which ultimately produce positive effects on an organism. 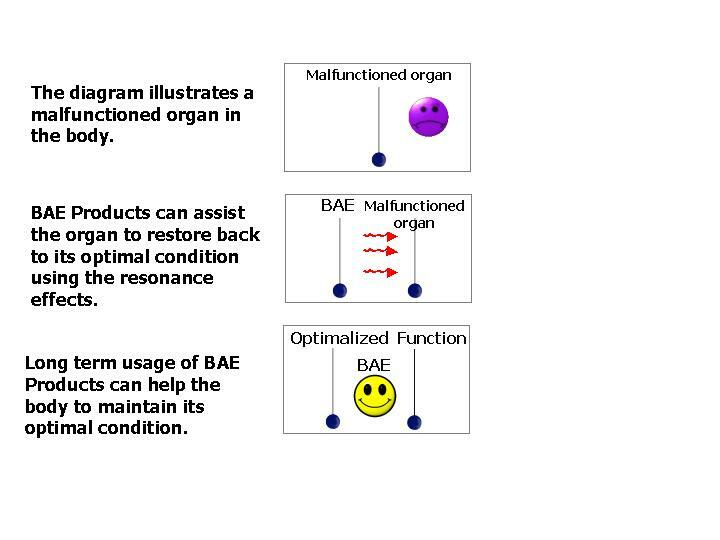 The effect of BAE Synergy Touch is shown in Figure 5. The images on top represent the patient before being subjected to the influence of the product. The patient shows definite zones of pathological oscillations in the head, kidney and spine area. After one hour of treatment with the product, the aforementioned oscillations do not appear on the images. Figure 5. GDV Energy field before and after one hour influence of BAE Synergy Touch. Figure 6. GDV Diagram before influence of BAE Synergy Touch. Figure 7. GDV Diagram after influence of BAE Synergy Touch. Figure 8. The soliton in dynamic. Quasiparticles have certain advantages over conventional waves. They can be distributed over long distances without any loss of energy (in the form of oscillatory excitation). Moreover, they can be accumulated in the environment as stationary waves – breathers – in the form of clusters of molecules pulsing on certain frequencies. Figure 9. Pulsing of breather in dynamic. In organisms, solitons excited by BAE products has the form of so-called peptide groups – configurations of oxygen, carbon, nitrogen and hydrogen atoms; with a certain frequency of oscillation. They are transferred along albuminous molecules where all other frequencies are filtered out. They could be described by the sine-Gordon equation ( - is a wave function). When solitons enter an area of the organism where its functions are damaged, they are able to recreate its pattern of frequency oscillation, being synchronized with higher and underlying levels of the organism’s bio system, thus restoring optimum functions of the organism. These features are found in products such as BAE Synergy Oil, BAE Synergy Liquid and BAE Synergy Cream. They were created by imprinting on them directly physiological electromagnetic oscillations. Why do some patients respond better than others? 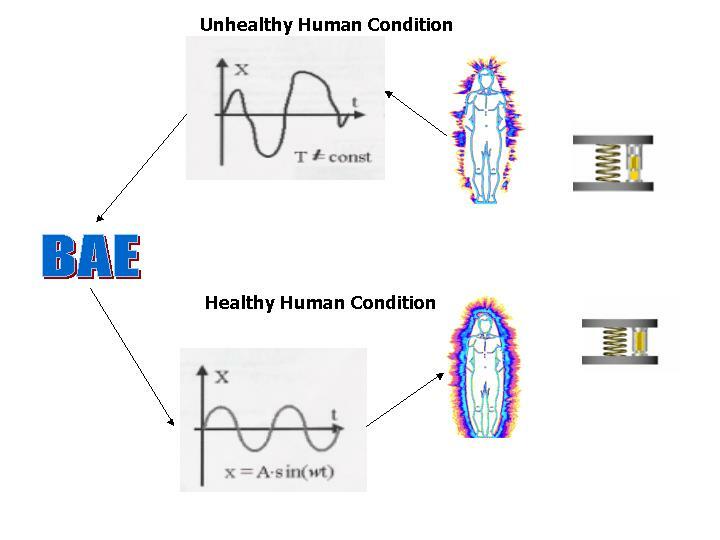 If the characteristics of the electromagnetic fields of both the patient and the product are similar or close to certain degrees, then the phenomenon of resonance is possible. The closer the frequencies match, the more probable the occurrence of resonance. If the frequencies are not similar, resonance is practically impossible. Any organism is a complex self-regulating (self healing) system and any influences on such a system will involve many different processes such as anatomical, functional, physiological and pathological interrelations. Any therapy that triggers the mechanism of bio resonance is a holistic approach of treatment. In holistic treatments, an organism’s own processes of self-regulation are activated, instead of forcing upon it unnatural and sometimes excessive methods of action. BAE’s range of products has resounding properties over a wide spectrum of frequencies, which generally bring beneficial influence to the organism. Health or illness always depends on an organism’s own ability to regulate its processes. Recovery from illness or disease can be achieved only through the restoration and balance of an organism’s own regulating ability. This is what the BAE therapy does for the organism – balancing and restoration of the self-regulating (self healing) ability.